click here for Thanksgiving 2011. 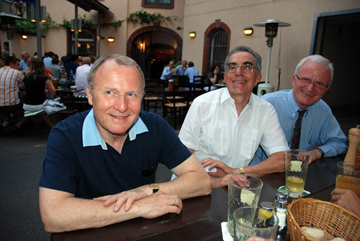 The German section of the Chase Alumni met at the cozy Restaurant ‘Volkswirt’ in Frankfurt on Main on May 25, 2009. As it was the hottest evening so far this year, the group enjoyed sitting outside. They also enjoyed an apple wine called ‘Gerippte’, a traditional potable for the region around Frankfurt, drunk neat or with water. When you order your first apple wine, it will taste a little bit strange. In Hessia it is said that you have to drink two to get familiar with it and by the third glass you will like it! Attending the soiree were: Jürgen Blumschein, Günter Buhr, Victor Canas, Alan Crutchett, Ines Gebbe, Günter Grehl, Sheila and Jürgen Gross, Reinhard Heilmaier, Peter Heinemann, Bettina Langenberg, Ingeborg May, Kate Pohl, Wolfgang Schaefer, Manfred Scheeder, Henry von Moltke, Antje von Rosen-von Hoewel, Andreas Willius and Jürgen Wittayer. In the absence of chapter coordinator Peter Gatti who was unable to join the group, Peter Heinemann welcomed Chase alumni and their partners at the Maingau-Stube in Frankfurt-Sachsenhausen for the Frankfurt chapter's traditional Thanksgiving dinner on November 27, 2008. In his opening remarks, Peter referred, of course, to the major disturbances the financial industry is facing. He also quoted Jamie Dimon, who started his remarks at the reception at 270 Park Avenue by saying, “Your money is safe!” but concluded, “We should be prepared for dark scenarios in ’09 but we’ll be fine.” Wishful thinking? As Roland Framheim had to catch a flight back to Hamburg that evening, he received privileged treatment and was served the main course ahead of the group. We all watched him enjoying the goose (of course only part of it) and later on indulging on the crunchy goose pieces, which were of high quality. Special thanks were directed to Ines Gebbe who had recommended the venue and who did most of the preparatory work. The excellent food was accompanied by good conversation and some networking among the 25 participants who attended the dinner. Attending were: Jürgen Blumschein, Uschi & Günter Buhr, Roland Framheim, Ines Gebbe, Günther & Edda Grehl, Heiner & Prof. Sieglinde Hartmann, Peter & Marga Heinemann, Jürgen & Nelli Klemm, Bettina Langenberg, Andreas Lieven & Alice Bauert, Artur Mertens, Manfred Scheeder, Dr. Rolf & Michaele Stokburger, Antje & Reggie v. Rosen-v. Hoewel, Henry von Moltke & Spouse, Jürgen-Lewin von Schlabrendorf.